Protecting yourself against employee lawsuits has never been more important – or affordable. 24 times a year, stay on top of what the courts are saying about how to run your workplace legally, and then communicate it effectively to the staff. 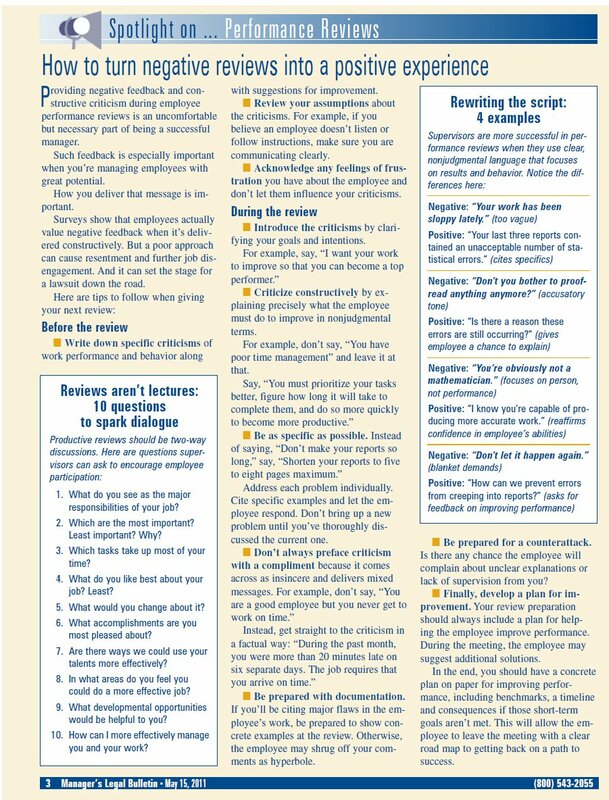 Q & As … even advice on raising morale and increasing productivity. They're all here, collected for one purpose: to keep you out of court. 1 Year Subscription (24 biweekly issues). Because the world of HR law moves fast, we publish twice a month. You'll always be on top of the changes you and your managers need to put in place to stay in compliance. Access to your current issue – and every issue from the archives – 24/7 through this website. When you subscribe to Manager's Legal Bulletin, you're compiling a library of advice and training. Download whatever PDF you need anytime in addition to receiving your print edition in the mail. News and trends from the HR world delivered right to your inbox each week. It's not just content from the newsletter – we always have our eyes on multiple sources. A $67.00 value, yours free. Here are the solutions to 160 tricky HR situations that have the potential to become legal nightmares. Normally priced at $74.75, this set of briefings delves into the 5 most timely and crucial HR topics as identified by reader demand. 81 customizable training handouts, covering 9 key areas of concern – ready for distribution to your supervisors as situations and training arise. Sold for $123 to non-subscribers, it's included free with your issues. Click here to instantly see the kind of current and concise information our editors assemble for you every two weeks. Self-assessment: What do you know about keeping your workplace safe? Applicant posts extreme views online: Can we refuse to hire? We're as comprehensive as possible so you can go home at night knowing you've done everything you can to be your organization's most effective watchdog. 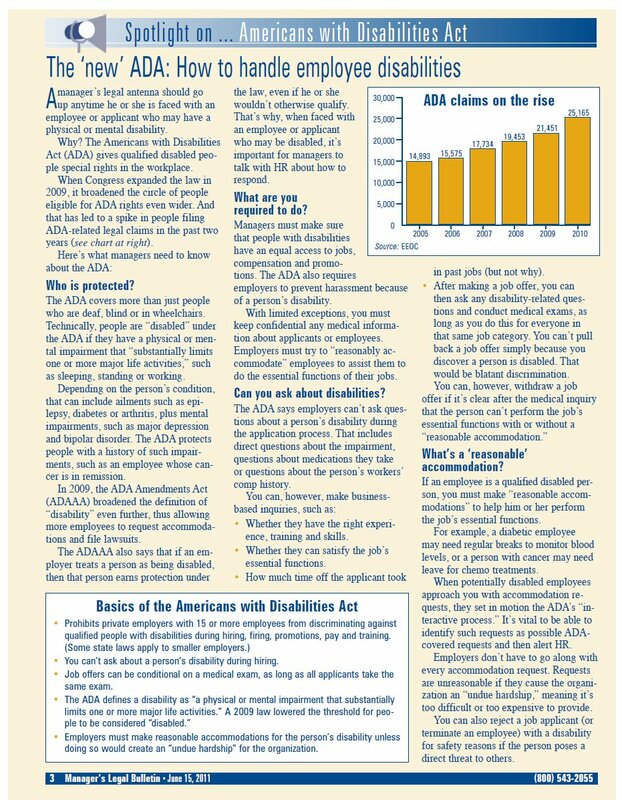 How well do your people know the FMLA, FLSA and ADA? Are they familiar with the PDA? Do they understand the ADEA, or even USERRA? The bad news is that they don't even have to have heard of them to accidentally violate them. One comment, one paperwork slip, one note scrawled on a piece of scrap paper … these are all it takes to start a lawsuit rolling. Everyone needs to come to work prepared for misunderstandings and just plain boneheaded decisions. Manager's Legal Bulletin aims to safeguard against them and look on the bright side too, with articles on making teamwork better, hiring more efficiently, improving time management … making a happier workplace in general. 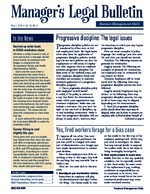 Subscribe to Manager's Legal Bulletin completely risk-free! If at any time up until the last issue of your subscription you are not happy, simply let us know and we'll rush you a 100% refund. 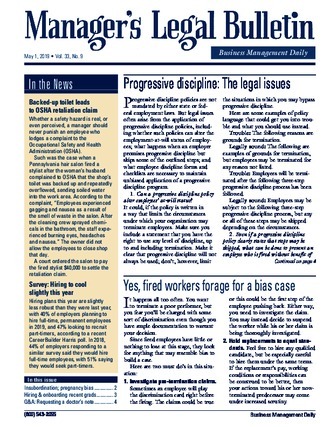 All of the past issues and valuable reports are yours to keep, just for giving Manager's Legal Bulletin a try. Big multi-copy discounts on Manager's Legal Bulletin are now available, because this is the kind of information that needs to go viral within your organization. Contact Paul Legrady at 703-905-4550 to take advantage of the savings. How much time do you realistically have each month to make sure your managers understand the legal implications of everything they do? Let me answer that question for you: about 20 minutes, give or take. That's it. 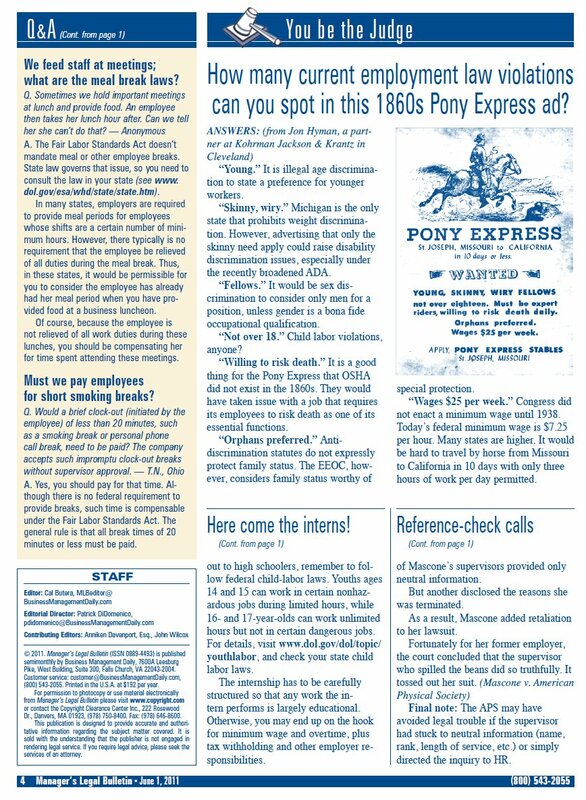 So we've designed each 4-page biweekly issue of Manager's Legal Bulletin with the goal of getting you the most important compliance information in the shortest amount of time. One lawsuit is all it takes to disrupt the company, to cast a shadow over everything you're trying to accomplish. And the workplace is only getting more litigious. When I look at the crazy dollar signs being awarded in suits related to harassment and overtime violations alone, I cringe, and then I re-dedicate myself to reaching out to help you educate your staff. I no longer think of Manager's Legal Bulletin as a helpful guide; I think of it as a power tool, something absolutely necessary to solve problems quickly and make sure they stay solved. Let's work together to keep your workplace free of legal headaches. © Business Management Daily 2019. All rights reserved.